How do you carry a heavy e-bike and trailer when there ain’t no mo’ room? Like this! After carrying my Raleigh in the traditional way – a bike rack bolted to the rear bumper of the Defiant – I determined not to repeat that setup with my new Evelo Aurora e-bike. First, the filth back there is stunning on a dusty gravel road. And, it sticks to anything that is or ever has been lubricated. A bicycle is nothing if not full of nooks and crannies, and trying to keep up with the problem has proven impractical. Second, the Defiant’s spare tire already lives back there, greatly complicating rack choices and durability. Third, the Defiant’s bumper is a pretty thin square tube of metal with 20 years of rust on its interior. I have this nagging feeling that the combination of a spare tire, rack, the e-bike, and the trailer bumper might part the ways someday, and I’d never know it while I’m driving. I dropped a rack, with bike, many years ago, and don’t care for a repeat performance. The rack came through fine. The bike, not so much. The truck bed is not an option for storage, as it’s already full of toolboxes, propane tanks, large bins of waste and freshwater hoses, leveling boards, ladder, and of course the Tankmin fresh and wastewater tanks. Stowage inside the trailer, nervously recommended by Evelo during transport in bad weather to protect the bike, is a sensible idea to keep rain from entering places that water must not go, at highway speeds. Not good for either lubricated bearings or electronics. But not practical in the Defiant’s interior, unfortunately. They were kind enough to give me a lightweight bike cover for stationary storage in the boonies. In the only spot left, not too much can be done to protect it at 60 MPH in the rain, except not driving in the rain. 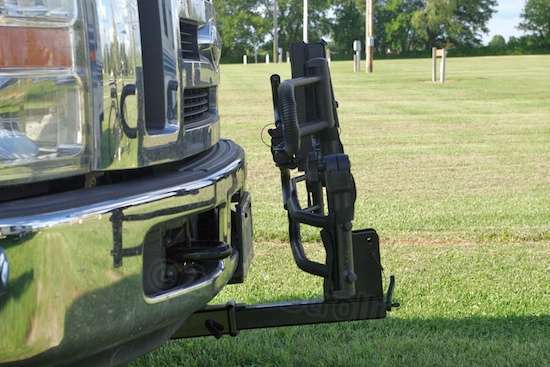 So the bike and trailer storage issue fell to the front end of the Ford pickup, and the only way to get a sturdy bike rack up there is to add a front hitch receiver. These are often used to easily maneuver trailers in tight quarters. With a working vertical load limit of 500 pounds, such a rack can easily support the weight of a 65-pound rack, 65-pound bike, and 20-pound trailer. I ordered a Curt front hitch receiver at eTrailer, and had it installed in a local body shop once it arrived. With 2 people or 1 person and a transmission jack, it’s not a bad job to install it oneself because it’s held in place by just 4 bolts. 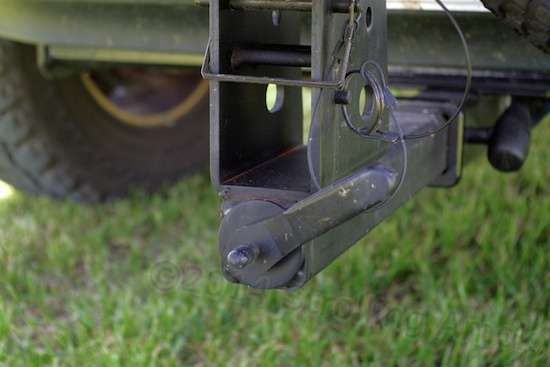 Naturally, I couldn’t see wrestling with a 46-pound hitch while laying on the moist grass with my skinny axle jack, and so with no time to waste, I had to assure the body shop that it was a pure bolt-in affair before taking it in. Done. Folded up, the rack adds 14 inches to the 22-foot length of the truck. Just use care in tight parking! 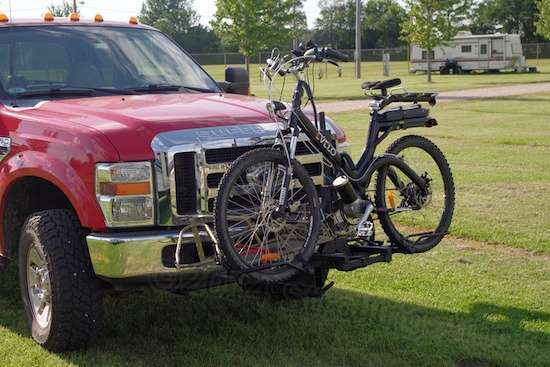 I ordered a Hollywood HR-1450E bike rack from the same outfit at the same time, as I felt it was the only real option for what I had to do with it. This model is a “platform” style carrier, which holds two e-bikes under their wheels. The traditional type of carrier that hangs bikes by their top frame tube just wasn’t going to cut it with the Aurora, which has no top tube. 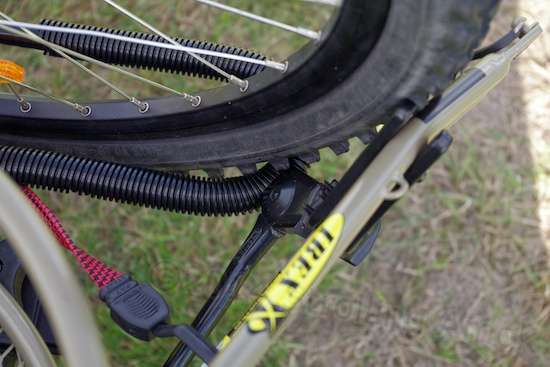 Universal adapters are available that create a top tube for step-through bikes, but these are clumsy and time-consuming affairs that tend to wear paint off the bike in use. They’d also require me to lift the heavy bike into place in one shot – something that isn’t going to happen. One question I had to ask myself was whether I couldn’t scrape by with a lesser carrier with a 70-pound load limit. They are a lot less expensive. Three things worked against this. 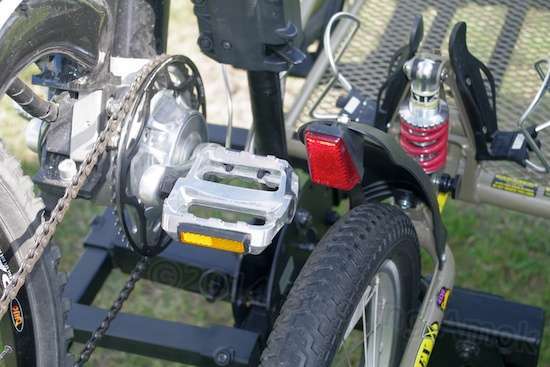 First was that, for easy access, the e-bike would need to be carried in the outboard position on it, increasing stress over what it’s rated for. Two, most racks commonly have warnings against going down rough roads, mainly I think because of the tremendous twisting forces that center on the single stalk that supports the entire rack. Thirdly, the fact that the Mighty Furd has what’s called a “snowplow prep package”, which means that it’s equipped with much stiffer springs than normal to help deal with a thousand-pound snowplow hanging off the front end. Good for snowplows, bad for bike carriers. And rough roads are unavoidable both on Illinois’ paved highways and Arizona’s washed-out gravel trails. It’s pretty stiff up there, and the Ford can easily both compress spinal columns and drive the breath out of you with a whoosh, on the right trails at the right speeds. Any bike rack up there is going to have to be working at well below its load limit to survive. I found that out with the cheapie Swagman rack in back of the trailer. You can see the extra structure toward center, and I wrapped some premium 3M electrical tape around a couple of loops, as well as adding plastic wire protector over that. The goal is to slow down paint loss on both the platforms and the carried items. 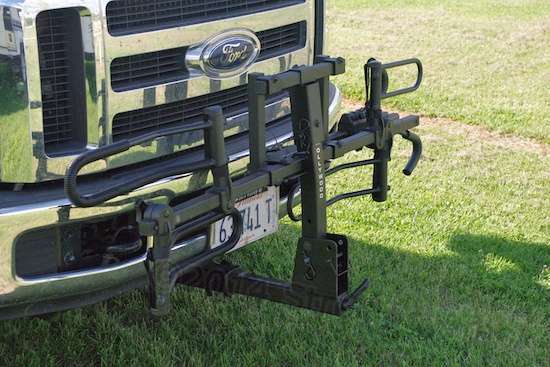 This particular Hollywood rack has some extra structure to deal with the twisting forces that concentrate onto the shaft that slides onto the hitch receiver, so it looks like it’s the best option by far. Running over your own dropped bicycle would be considerably worse than losing it off the back end of the rig, but at least you’d instantly notice the loss as it passed underneath, tearing out hoses and puncturing pans and fuel tanks. 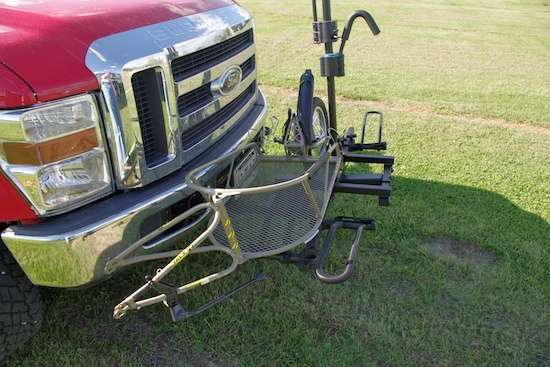 A sturdy front-mounted rack is not something to cheap-out on. Assembling the rack was a bit confusing, because the very competent-looking step-by-step instructions had a few big information gaps along the way. But in the end, I had a decent-looking bike rack with no leftover parts, so I guess I succeeded. The Hollywood rack is nothing if not easily reconfigured to fit just about any bike. I had no idea if it would provide room enough for the BOB bike trailer though, wedged between the Aurora and the Ford’s grille. Evelo’s advice was to carry the Aurora chain-side to the rear, to try to protect the semi-exposed drive ratchet system from driving rain. That meant aiming the front of the bike toward the curb. 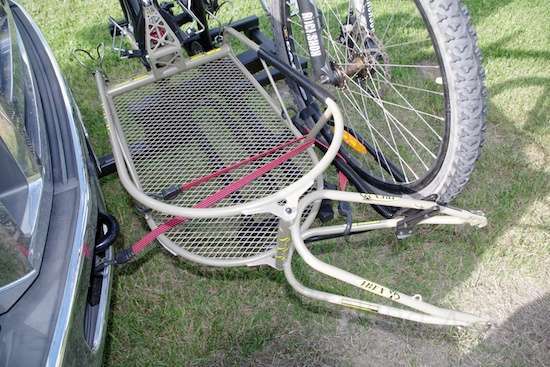 The rack’s steel loops that support the bike are easily locked and unlocked to slide around to fit. This came in handy, because fit proved elusive once the Ibex trailer came into play. The Aurora needs to be carried “backwards” to try to protect the chainring-side drivetrain and wiring passthrough in the frame tube from driving rain. Night driving is still okay, though I don’t do much of that anymore. To mount and lock one’s bike into the frontmost space is absurdly easy. Just lift the front of the bike to place the front tire into it’s steel platform loop. Lift the rear of the bike and set the rear tire into its loop. 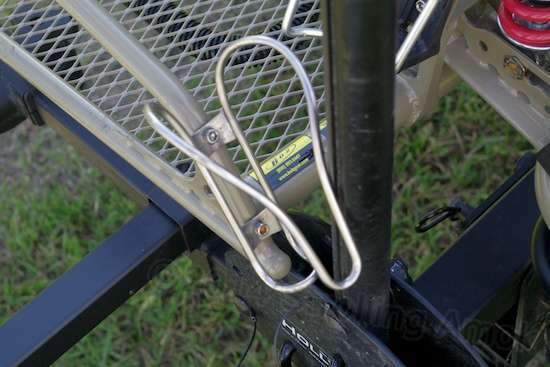 Then squeeze and hold the quick release on a sliding hook that’s mounted on the vertical stalk in the center of the rack. The big hook lowers down over whatever bike frame tube is available, and presto, the bike is secure. The tires can’t jump up out of their loops because the bike is no longer free to move upward. A Velcro strap is provided at each loop just in case something isn’t quite right. They aren’t locks so must as dissuaders. Getting the bike in or out of the carrier takes about a minute, and that’s at my leisurely pace. That handiness trait makes it unconvincing for me to pull into a questionable, unfamiliar trail and think to myself that it’s too much work to pop the bike off and go tour for trail conditions and a workable campsite – something not best done by taking the entire rig in, I can tell you. Getting the heavy bike up and on is a lot easier when the front wheel is placed in its platform loop first. Then grab the back and have at it. 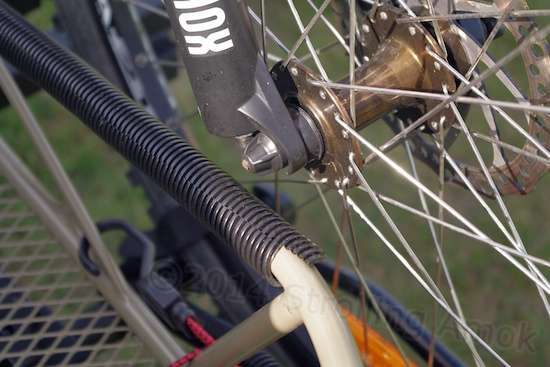 Hollywood recommends that, for the safest hold on any step-through bike frame, that the large padded hook be placed at the lowest point on the frame. Good idea, considering that if anything goes wrong, an improperly placed step-through bike could then move forward and possibly pop a wheel out of its loop. This is where overall fit of the Aurora and the Ibex became problematic. It was like 3.5 pounds in a 3-pound bag. To keep the platform rack to a manageable size, the Hollywood wants any bikes to be mounted with their chainrings outboard, otherwise there’s a strong possibility of it interfering with the vertical stalk, and the chainring would lose the conflict. I need the bike in the front position for quick access, and facing the wrong way to place the chainring out of the wind/rain. That means sliding the platform loops to hold the bike off-center enough to avoid this contact and damage. 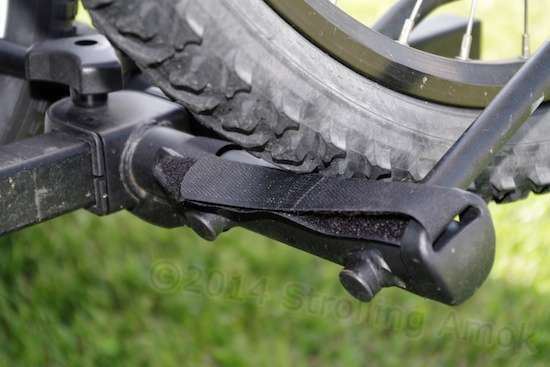 And with a step-through frame, that means that the hook is no longer holding the bike at its lowest position. Potential safety issue. The big padded hook should really be down at the bottom of the “V”, but that puts the crank in contact with the vertical pole. So, this is it. Likewise, the trailer needs its tire to be in a platform loop as well, and with its little 16″ tire, it goes in deep. The body of the trailer needs to rest on top of the other loop. Naturally, the loops aren’t meant to do this, and had to be mounted reversed, pointing inward to do the job. All told, it took more than several tries to reposition all the loops to adequately support both vehicles without interfering with both each other and the rack’s vertical pole. It’s close – very close – but it all works out. The only non-optimal side effect is that the hook holding the bike down is not in the most secure position at the very bottom of the frame tube bend, so that’s just something I’ll have to keep an eye on. 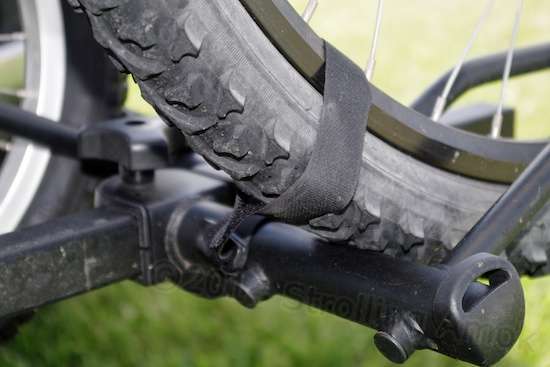 Those little Velcro straps may be asked to do more than they are intended to, and I may have to add one more at the back of the bike’s rear wheel as a precaution. One of the two tire straps in its stowed position. The same strap in action!! Despite this, I still find it amazing that it all worked out, because the rack was never intended to hold such a conglomeration of equipment. I’d like to confidently feign that I knew I’d be able to make it all fit, particularly with the bike aimed backwards, but it just ain’t so. The more I worked with it, the more it became plain that this was going to be a squeaker, if it worked at all. What’s it like on the road? Confidence-inspiring. I expected a lot of flex that just never appeared. Oh, now and then you can see the bike (and rack) move up and down once, maybe a quarter-inch, but that’s it. Side-to-side rocking just isn’t there either, despite the Ford’s stiff suspension. 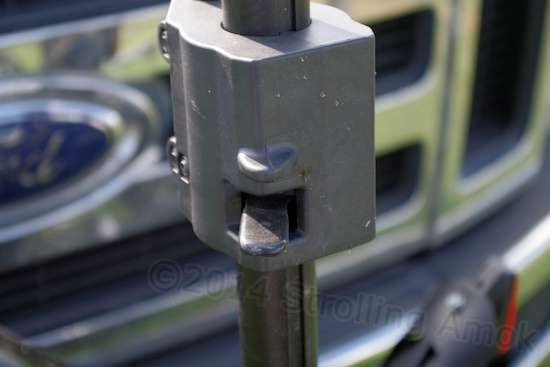 Of necessity, hitches don’t fit tightly into receivers, so one would expect some rocking, but the Hollywood’s hitch include a handled turnbuckle gizmo that pulls hard on the receiver hitch pin, preventing rattling and discouraging rocking. I don’t get to say this often, but the Hollywood HR1450E is a top-quality rack in all respects. Properly hooked and strapped in, the bike becomes one with the rack and shows no inclination to bail on me. This, combined with the easy in-out and the one-minute folding of the rack up out of the way when not needed makes the Hollywood rack a real winner. It’s combination of strength and ease-of-use is unmatched. 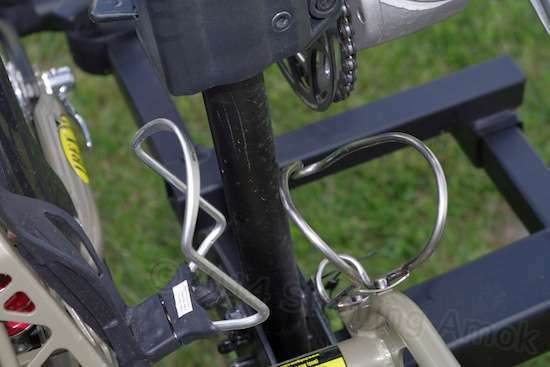 Plus, they include a locking receiver hitch pin to prevent theft, and a long, very high-quality cable lock for securing your bike(s) to the rack. Both locks are keyed alike. A very professional thingie here. Rotate the handle until it’s snuggly tight, and the hitch post is yanking so hard on the receiver pin that nothing can rattle or twist under load. It works well. Thankfully, this completes the e-bike pack mule “system”, though there will be little follow-ups later, in actual use. I still need to detail my modifications to the Aurora of course, though that may have to wait until I make it to the Bonneville Salt Flats in Utah. I say “thankfully” because some readers may have no interest in the equipment extravaganza this series represents, and I’ve pretty much run out of money anyhow. So we can both be thankful! The forward view works pretty well even though the rear rack and battery would normally not be there. Just put your thumb on the upper projection, squeeze the lower lever up, and the hook slides up or down on the pole as easy as you please. It refuses to slip at all, otherwise. Surprisingly reliable. Setting the 20-pound Ibex in place is easy, and its tire drops deep through a platform loop. The trailer underpan rests atop another loop. 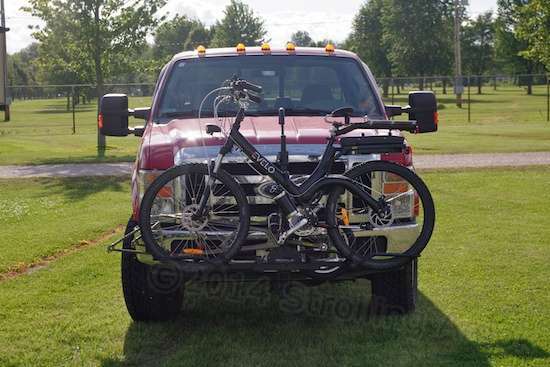 But notice that more needs to be done to anchor both the trailer body and its rotatable front fork, which wants to swing into the Ford’s bumper. if the trailer gets too far off angle, it can put bending stress on the misaligned trailer wheel rim. 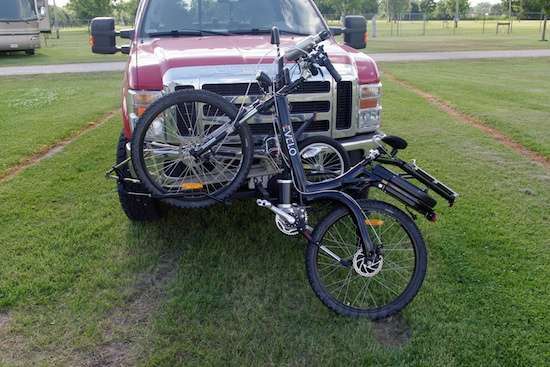 One strap gently pulls the trailer toward the bike and keeps it aligned, while the other pulls it away from the bike’s front axle stub and holds the trailer’s fork away from the Ford’s bumper. Proper strap tension is everything, but the protective wrap on the trailer rail limits contact in case of shifting during travel. 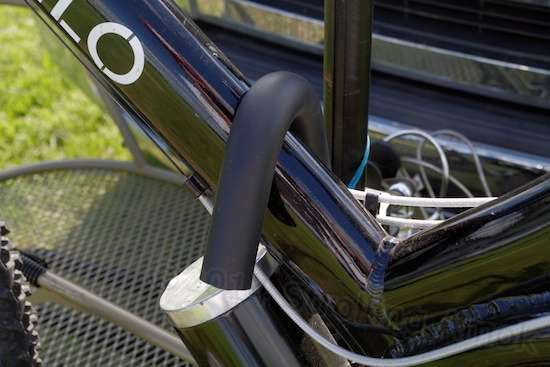 A piece of tape on the trailer fork helps protect its paint from the bike’s front tire, while the wrap around the platform loop intercepts the trailer kickstand. Platform loop positioning keeps the bike’s front chainwheel clear of the sliding hook assembly, and requires that the crank be rotated just so in order to have its own space. Time will tell, but the trailer’s strapping tends to keep the water bottle carriers just clear of the pole. 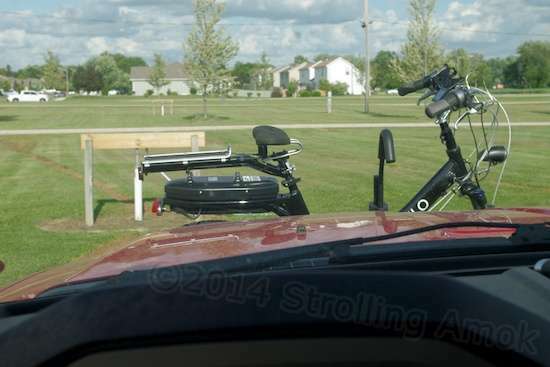 The inboard Schwinn carrier straddles the pole, while the unusual King Iris outboard carrier design bends around it. Another shot of the same area makes it clear just how tight the situation is. Some tape wrap on the pole may be in order to minimize paint damage, no? Relocating the trailer forward would eliminate this issue, but introduce a host of more basic and important fit problems. I’m repeating this photo just to point out that right turns at cramped two-lane intersections take some care, since a careless turn can swing that front overhang into the opposing lane. It’s tougher than you think, because the Ford’s long wheelbase prevents snappy turns. It tends to have a big intimidation factor at 4-way stops, and whoever’s stopping on the right tries not to be there any more once the Ford begins its slow turn. Wow what a wizard solution, and great explanation for us equipment nerds who live for this stuff! Well, we’ll both find out the wizard factor in a couple of weeks, when I’m in Utah! Thanks, Rod. Livin’ large on $41 a day. Nice looking rig. Ha! Good one, James! That was then, and as of this month, this is now. I stopped living off savings (except for raiding it for the e-bike stuff) and am now pulling Social Security. That outdoes my miserly budgeted expenses by a fair bit, lifting me squarely into the official poverty level, which is exciting! 😉 I find it sobering that all this stuff cost considerably more than my travel trailer did. Let’s hope it all withstands the abuse. SS, lucky you. 33 more months for me with a budget of $62.46 a day. I’ve been living off my seed corn for almost four years now. If it weren’t for the .000002% a year my savings was pulling in I don’t know how I’d make it. Thanks, Linda! I’m currently using a very similar product that seems to be working well, but the Strike Hold looks a bit less expensive. So, I’m adding it to my supplies list for a future try. True, Mary, and the same for chain. Trouble is, I don’t yet a have a good solution of what to U-lock to. 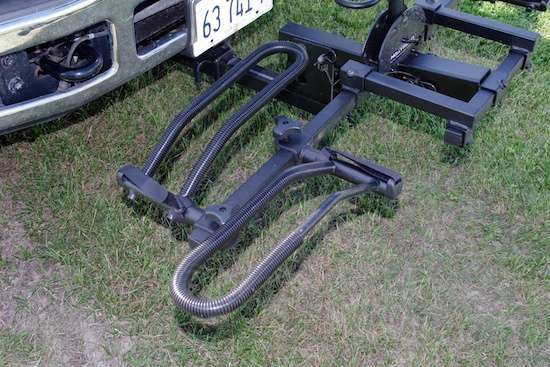 The carrier is easily disassembled with a hex and wrench, though the hitch stalk itself is better protected. At the moment, all I can do is dissuade against impulse theft, as I see it, and perhaps stuff the bike inside the trailer when I need to leave it there. It all comes down to managing risk appropriate to each place I am. Sometimes I’ll be better off leaving the bike when I need to drive somewhere, and sometimes it may be better to keep the bike with the truck.